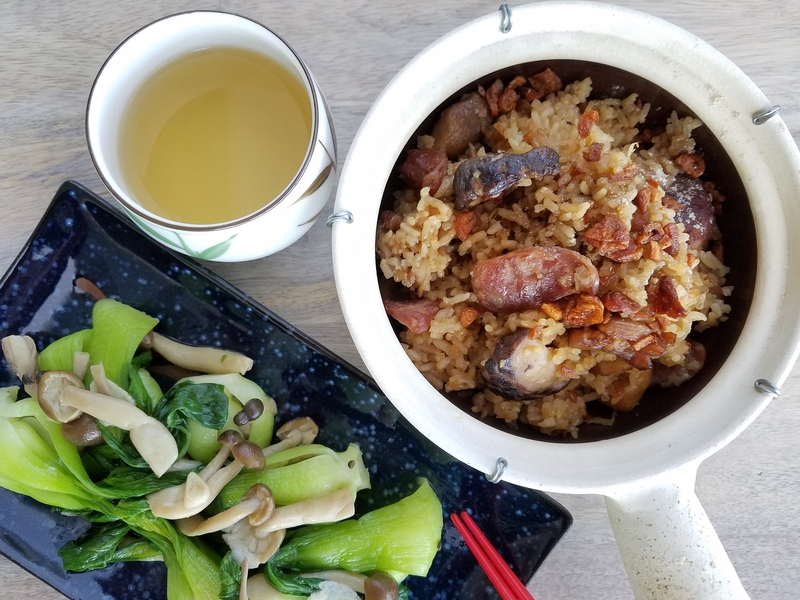 Claypot rice, stir-fried greens, and Chinese tea. A perfect combo for a family dinner on the weekend. The best part is that I cooked this in the rice cooker 😉. It so easy, yet so delicious. Marinade the chicken in the salt, msg, and soy sauce for at half an hour. Heat 2 Tbsp of oil in a hot pan and fry till chicken is cooked and browned. Set aside. Heat 4 Tbsp oil in wok and fry shredded ginger, shallots, and minced garlic until brown. Add the mushroom and stir-fry until the mushrooms is lightly browned. Add the rice and fry till the oil is absorbed. 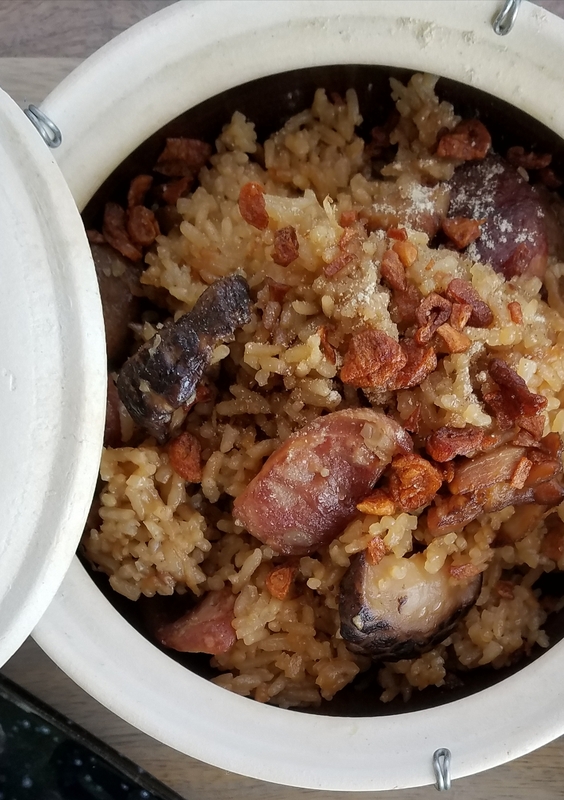 Transfer the rice and mushrooms to the rice cooker. Add the water and seasoning. Cook according to setting of the rice cooker. I like the rice to be harder, so I used the harder setting. 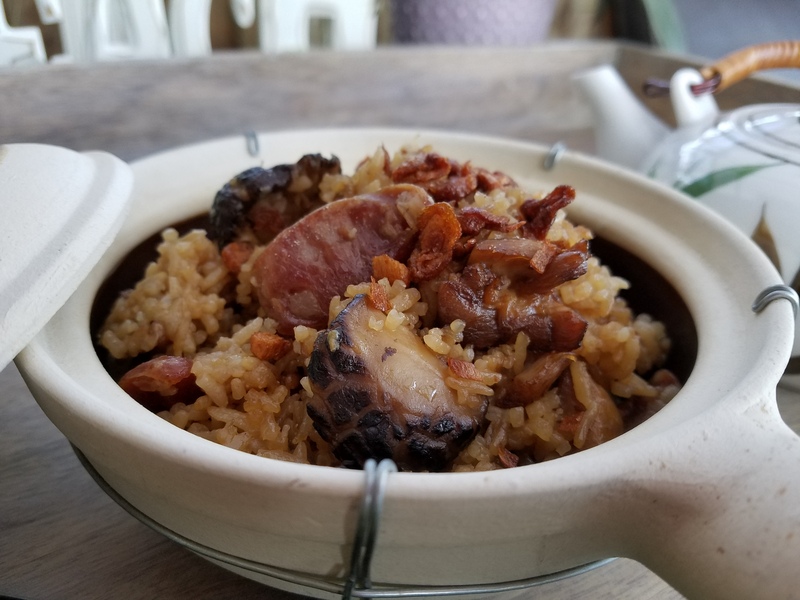 When the rice is cooked, cover it with the cooked chicken and fried sausages. Continue to keep warm until ready to serve. Garnish with fried shallots and a sprinkle of white pepper. Serve hot with some stir-fried greens and Chinese tea.